Why wouldn’t you go to these lengths for world famous Henry’s fish and chips? As we pick up speed and bump and bash noisily over the wake from a local pleasure craft, I start to wonder if this thing will ever take off. And then it does. With the engine whirring loudly, the bumpy ride is instantly silky smooth as the floats lift off the water and into the air. I stare down in amazement while a boat passes beneath us and the horizon opens up to the oceanic Georgian Bay. 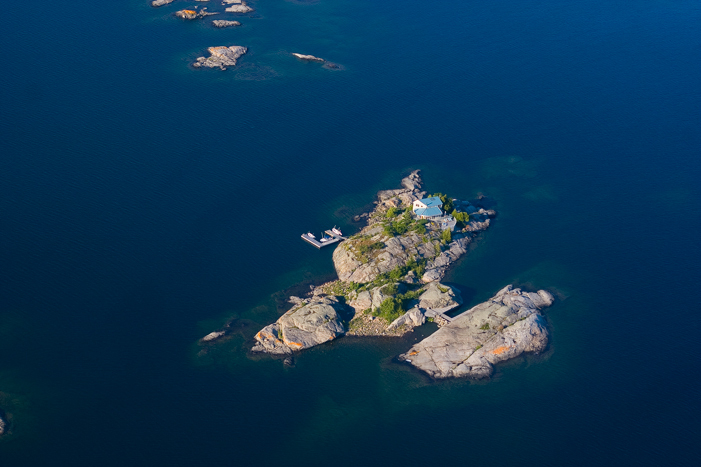 Below us, the 30,000 Islands are splattered across the water. Green forest and grey rock break up the freshwater blue. And though the noise from the engine makes it difficult to talk, there really is nothing to say; we stare silently and slack-jawed at the scenery below. Although the 30,000 Islands archipelago is a prime candidate for some of the best sightseeing flights around, that isn’t what we’re here for. We’ve actually come all this way for the food. We’ve heard rumours that Henry’s Fish Restaurant is world famous for its fish and chips. And the Georgian Bay Airways’ Fly and Dine package proved too much to resist. 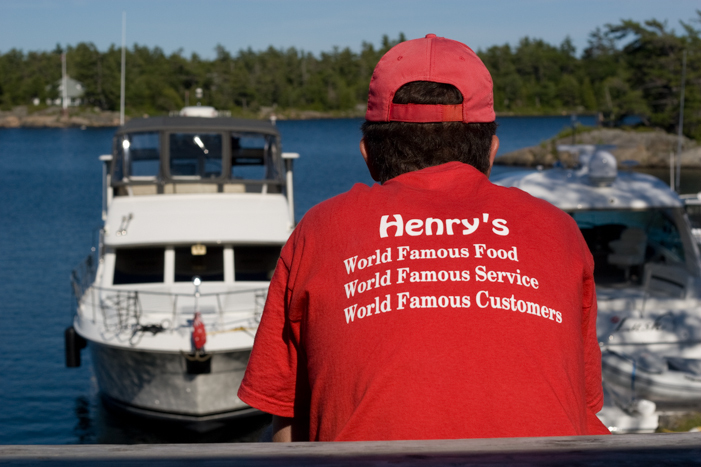 Located on Sans Souci (or Frying Pan Island), Henry’s is in the middle of some of the most beautiful cottage country in Ontario, 21 kilometres west of Parry Sound. With no roads going to or from it, the only way to get there is by boat or plane. The flight in a four seater Cessna 180 floatplane only lasts about ten minutes, but it’s plenty of time to get excited about what’s to come. And when asked about their famous customers, the usual names from the area are mentioned: Goldie Hawn, Kurt Russell and some hockey players. But one not so usual name is also mentioned: Jimmy Buffet. And I’m a firm believer that anytime you find yourself on the trail of Jimmy Buffet, you’ve discovered something special. Inside you find a rustic, but immaculate dining room. Long, eight-person picnic tables line the hall, with blue vinyl tablecloths like a dining hall at summer camp. Stuffed fish decorate the walls and one entire length of the building is window that faces out onto the water. The wait staff with their red shirts and smiles are as helpful as can be and even Paul Elliot, the owner, makes the rounds asking if everything’s okay. He’s a bit of a local legend, and justifiably so. He runs one of the best restaurants around. Elliot took over from the original owner, Henry LePage, 17 years ago. LePage, a local Metis fisherman, opened the place in 1978 and began serving boaters and cottagers as they passed through the Intercoastal Waterway. After years of dining there himself, Elliot bought the place following his retirement from the construction industry. The idea of a restaurant you need to boat to or fly to seems crazy, but that has never stopped Henry’s from being successful. There are enough cottagers and boaters in the area to keep the deep fryer sizzling. With seating for 200, a busy day can see up to 800 customers. There is not one, but two heli-pads, and earlier that day there were seven planes and one helicopter at the restaurant. Not to mention all the boats. It’s successful enough, in fact, that the restaurant made the top 100 in Saveur magazine’s 2001 issue – a huge accomplishment in the food industry and something Elliot is obviously proud of. But as Elliot puts it, business is business. His staff is dedicated, professional and accommodating. And their reputation for good food and a great experience are, apparently, world famous. Although Elliot refers to the place as a shanty, it is anything but. Compared to some of the cottages around here, the Royal York would be a shanty but Henry’s is as clean, organized and efficient as some top landlocked restaurants. Elliot put a lot of effort into making sure the restaurant runs as efficiently as possible and proudly boasts that a fish and chips dinner can be turned around in the kitchen in 15 seconds. When our meal arrives, seemingly minutes after ordering, our picnic table is covered in plates of battered and pan-fried goodness. Generous servings of baked beans, coleslaw and French fries all take second-tier importance to the fish. The battered pickerel is served family-style. Thin, crisp batter coats the sweet, flaky freshwater fish. The pan-fried pickerel (highly recommended by our pilot and a local park warden) is an entire fillet served on an oval platter. Lightly dusted with seasoned flour before being pan-fried gives it a crisp exterior that contrasts with the soft fish inside. Wash that down with an ice-cold Heineken or Caesar, a classic Georgian Bay view, and you’ve got the perfect meal. Add to that a Henry’s ‘world famous’ butter tart that oozes sweet gooey goodness and you’ve officially gone over the top. Satiated, we hop in the plane and enjoy taking the longer route home. 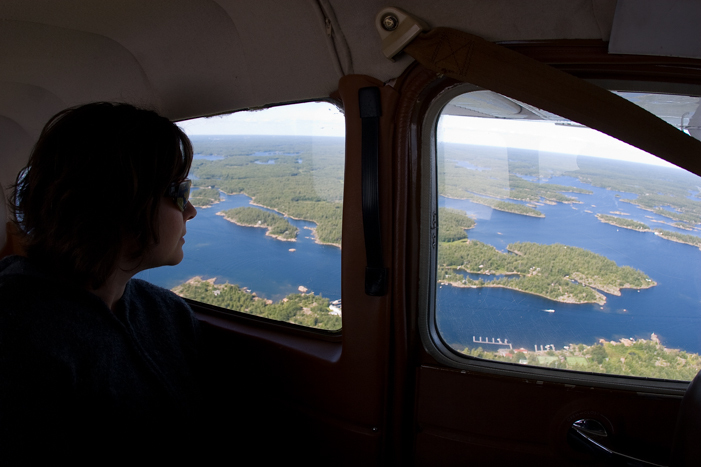 About 15 minutes of incredible 30,000 Island scenery spreads out between us and Parry Sound. As the sun throws its late day light on all the tiny islands below us, it’s certain we’ve discovered gold. Discovering Henry’s is like joining an exclusive club even though it’s already as famous as a fish and chips place can be. It’s like being let in on a secret that only people like Jimmy Buffet know. The Henry’s Fly and Dine package through Georgian Bay Airways is $174.95 plus GST per person (including meal). Open 11 a.m. until 9 p.m. seven days a week from Mother’s Day weekend until the end of September.